A neotropical migrant with a drastically decreasing population, the golden-winged warbler is one of the most highly sought-after target birds for North American birders. Brilliantly colored, this member of the Parulidae bird family is easily identified when seen well, but because of extensive hybridization, similar birds can be confusing to separate. This detailed fact sheet can help birders learn more about the golden-winged warbler, how to identify them, and where to see these beautiful birds. These birds have a relatively long, thin bill that is sharply pointed. Males and females look vastly different, with males more brilliantly colored and females more camouflaged. Males have a bright yellow crown, black lores, and a black cheek patch, as well as a black chin and throat. These facial markings contrast boldly with a white eyebrow and white malar stripe. The nape, back, and rump are gray, and the underparts are whitish with a gray wash on the flanks. The black wings have a wide yellow patch. The eyes and bill are black, and the legs and feet are dark. Females have similar markings but are paler overall than their male counterparts, with gray rather than black lores, auriculars, bill, and throat. Females may show less extensive yellow on the crown and wings, but the overall color extent can be variable. Juveniles are similar to adults but with less distinct markings with more of a blurred or fuzzy appearance. 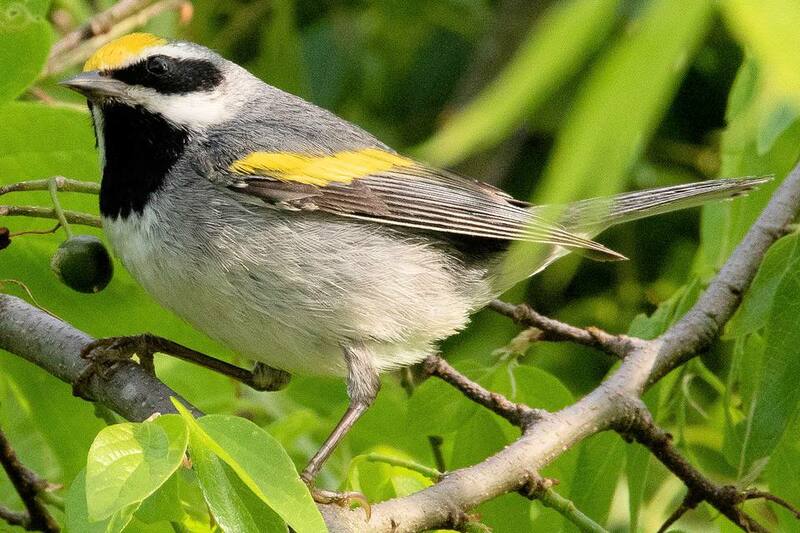 Male golden-winged warblers are exuberant singers in early spring as they claim territories and work to attract mates. The typical song is a rapid warble followed by three buzzy, drawn out "tzip" notes. The song lasts three to four seconds, and may be repeated frequently as the male perches out in the open to proclaim his strength. These warblers prefer a fractured, patchy habitat such as woodland borders, gardens, shrubby growth, swamps, bogs, marshes, and scrub riparian zones. While less mature areas are preferred for breeding, after fledglings have left the nest, these warblers tend to move into adjacent regions with more open, mature forests. During the summer breeding season, these birds are found in suitable habitats from southeastern Manitoba to northern Minnesota and Wisconsin east to southern Ottawa, New York, and Vermont, as well as throughout Michigan. Their breeding range also extends into the Appalachian Mountains as far south as eastern Tennessee, western North Carolina, and northern Georgia, though much of the Appalachian population has been extirpated. In winter, these birds migrate to Central America from Belize and Guatemala south to northern South America in northern Colombia and eastern Venezuela. Golden-winged warblers also spend winters in Cuba, Puerto Rico, and the Cayman Islands. Vagrant sightings are occasionally recorded much further west than expected, even as far as along the Pacific coast, as well as in other parts of the Caribbean. Vagrants are most often seen during fall migration. These are relatively active warblers that flit about in tree canopies where changing light patterns and shadows help their bold plumage blend in. When flying between trees, their flight has a fluttery quality. While these aren't extremely territorial birds, males may aggressively chase or even fight rivals during the breeding season. These warblers are acrobatic foragers, often dangling upside down as they glean insects from leaves and branches, typically low or at mid-levels in trees and shrubs. They are primarily insectivorous and eat a range of different bugs, including caterpillars, spiders, and grubs. These are monogamous birds. The female builds a cup-shaped nest on the ground, often at the base of a tree or hidden by tall grass, using leaves, bark, and grass and lining the interior of the cup with hair or fur. These warblers are subject to brood parasitism from brown-headed cowbirds and will often serve as foster parents to the unexpected family additions. The oval-shaped eggs range from white or cream-colored to a pale pink and are marked with small brown or lilac spots or splotches. There are four to seven eggs in each brood, and only one brood is raised each year. The female incubates the eggs for 10 days, and after the altricial young hatch, both parents feed the chicks for an additional nine to 10 days until they are ready to leave the nest. Golden-winged warblers regularly hybridize with blue-winged warblers, creating distinct offspring that are named Brewster's warblers. Those offspring may themselves hybridize with other full-species golden-winged warblers, and birds from this third generation are Lawrence's warblers. These hybrids are not separate species, and each one shows strong but indistinct characteristics of golden-winged warblers. The golden-winged warbler population has decreased by more than 75 percent in the last 50 years and these birds are classified as near threatened, though they are not yet officially endangered. Habitat loss and genetic dilution from cross-breeding and hybridization are threatening this warbler, but birders can help by not only protecting habitat at home, but also supporting sustainable, bird-friendly agricultural practices such as shade-grown coffee and cocoa plantations in Central America where these birds spend their winters. These warblers are not common backyard birds and are not inclined to visit yards or gardens, but avoiding pesticide use that could eliminate food sources can help attract these birds. They may also forage in leaf litter and they are responsive to pishing, particularly early in the breeding season when males are more aggressive. This bird's range is expanding slightly to the north, and birders who take steps to create the type of patchy habitat these warblers prefer may have success in attracting them. Warblers are some of birders' favorite species, and there are many beautiful and distinctive warblers to enjoy. Before looking for different warblers, however, birders should brush up on their warbler identification skills to be able to tell these sometimes similar birds apart. Taking steps to attract backyard warblers can make seeing these birds even easier by bringing them right to a birder's yard. See more of our informative bird profiles to discover all your favorite species!